The Recare Report lists patients with recare attached to their records. The list is organized alphabetically by recare type. And, for each recare type listed, the following information is also displayed: the recare due date, the date of the next appointment scheduled for that recare type, the patient name, the patient's primary contact, the primary contact's phone number, and the date of the patient's last visit. 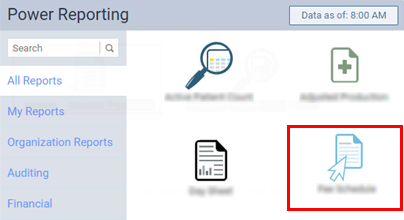 On the Power Reporting page, click (or tap) the Recare Report icon.